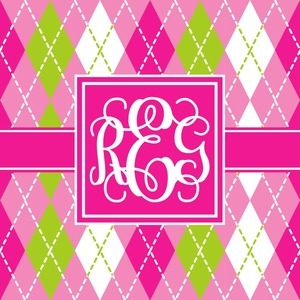 Looking for a preppy, yet still girly girl design? This pink and green argyle print with a square label and an interlocking monogram is as girly as it gets. We have created this argyle pattern in lime green, orchid pink and hot pink. For all of us girly girls and preppies and princesses, this design is a favorite!